If you love sewing, quilting or just doing fabric crafts, you know that despite your best intentions, you often end up with way more fabric that you needed and now you are stuck with scraps of fabric that didn't get used. It seems like such a shame to throw these away, but what do you do with them? Here are 15 scrap fabric projects that seem like so much fun! Make a No-Sew Valance. Just take the colors of scrap fabric that you have that go with your decor and create this no-sew valance for country chic appeal! For another home decor project, make a matching Lamp Shade. It's easy and again, looks very shabby chic. Patchwork Posse has a great Scrappy Doll Quilt tutorial for using up rectangular pieces if you have them from other quilting projects. Make your fridge look great with these Scrap Fabric Magnets. Frugal and fun! Are you big on books? Make these Fabric Scrap Bookmarks from Crafty Mummy. This Burlap Fabric Wall Organizer is great for using up scraps of burlap and fabric and it keeps things neat as well. If you have some larger pieces of fabric, why not make these quick and easy Cloth Napkins? They are frugal and good for the environment. Similar to those tutus that were popular a while ago, make this Fabric Scrap Strip Tutu from Create Kids Couture. If you have a Kindle, iPad or other type of tablet, and you have some larger pieces of scrap fabric, make this easy Tablet Cover for them. These DIY Fabric Headbands from Alice & Lois are right up my alley. I love a good headband to add to my collection. Do you have a kitty that goes crazy for catnip? Make them this super easy Catnip Toy using scrap fabric. For another great fashion accessory, make these DIY Fabric Necklaces from How Does She? Another great use of scrap burlap and fabric are these Burlap Place mats with a Silverware Pocket. Make this DIY Infinity Scarf from The Scrap Shoppe. This one looks great and says it is easy for beginners. If you happen to have an old crate, this Ottoman is a great way to use it and would look awesome on a porch. 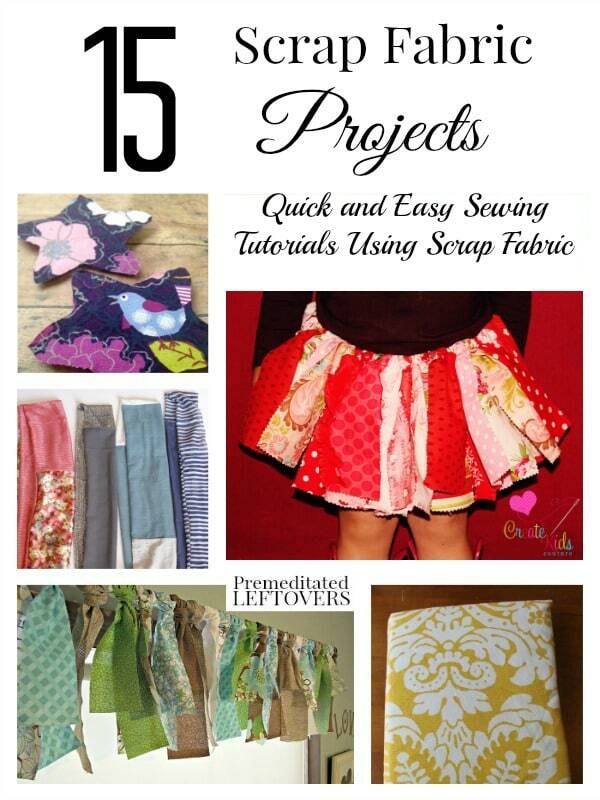 This list makes me wish I had more scrap fabric! Which ones are your favorites?